All of these wise men could also be describing the world of whiskey. The importer and distiller of what was previously known as Anchor Distilling is now known as Hotaling & Co. This comes after Anchor Brewing was acquired by Sapporo–but not their distilling arm. Hotaling & Co.’s “new” name comes from A.P. Hotaling, spirits dealers at the turn of the 20th century in San Francisco, whose whiskey warehouse survived the 1906 earthquake and fire. You might also know them from their Old Potrero whiskey, which I tried a couple years ago and enjoyed. We’ve also written about another of their limited whiskies, too. As we previewed back in May, J.H. Cutter was the newest addition to the company now known as Hotaling & Co.’s offerings. The new offering is 73% sourced bourbon from Kentucky Bourbon Distillers aged 4.5 years, 17% Old Potrero 18th Century Style Rye Whiskey aged a minimum of 3.25 years and 10% Old Potrero Port Finish Rye Whiskey aged 4 years. It is said J.H. 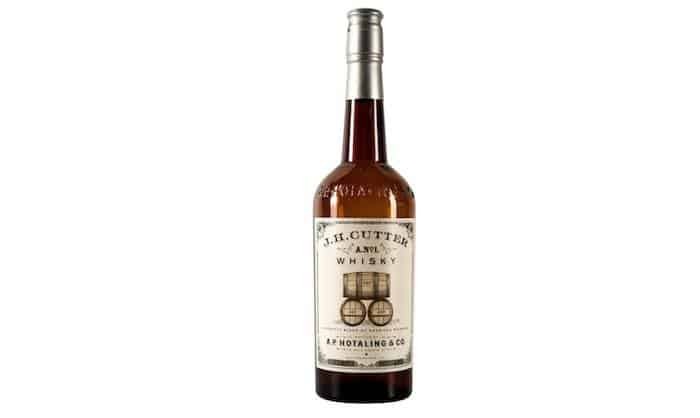 Cutter Whisky (using the spirit’s spelling at the time) was one of the most celebrated whiskeys in late 1800s San Francisco. I was kind of excited about the possibilities that these many blends hath wrought, especially because I’d liked Old Potrero so much. Would change be good? Or would it keep me stuck in the past, longing for the old mix, unable to move on? Vital Stats: 96 proof, 73% sourced bourbon from Kentucky bourbon distillers aged 4.5 years, 17% Old Potrero 18th Century Style Rye Whiskey aged a minimum of 3.25 years and 10% Old Potrero Port Finish Rye Whiskey aged 4 years, goes for around $50 a bottle. Appearance: Yellowish ochre, toasted turmeric, a freshly stained deck in the noon sun. Nose: Fruity: Heavy on the pear, light on the mango. But it doesn’t smell like artificial fruit. Actually, no: I take that back. It is kind of artificial. You know what it smells like? The light blue marker on the scented marker set I had in third grade—which was supposed to be mango-scented and was my first exposure even to the word mango. Proust had his Madeline, I have my whiskey. Seems fitting. Also: Powdered cocoa. Also: macadamia nuts. All very pleasing, really. Palate: This starts off very smooth, also pear-like. The mouthfeel is pleasant. But then…it finishes with a weird mix of anise and peat, and a little heat. Some like peat and anise. I find those flavors…less pleasing. It has a finish, to me, like a restaurant mint you grab while exiting the joint and then aren’t happy you put in your mouth.